Using the poster links below you will be able to view a pictorial Standard for both varieties of collies. These pictorial Standards are educational posters used by the Tasmanian Collie and Shetland Sheepdog Club. (If you would like a copy of one or both they are available from the Club in A1 and A0 sizes. Contact me through this website and I can help you and give you costs). entire but have been put into point form with pictures to illustrate some of the concepts. 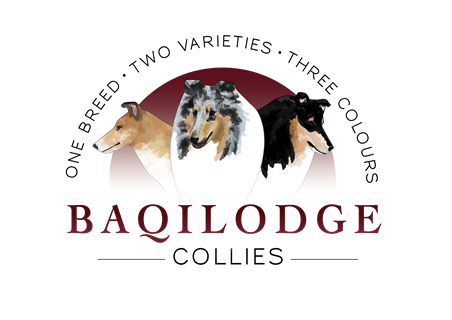 the current Standards for judging both Rough and Smooth Collies in Australia. approved by the Kennel Club, England. Every breed of dog recognised by the Australian National Kennel Council (ANKC) has a written Breed Standard. breeders – in our efforts to breed the most correct dog possible. (Unfortunately, perfection is never completely attained in any one specimen). judges – to determine which dog best fits the description of their breed. Each Breed Standard is quite detailed and what might be a fault in one breed may be a desired trait in another breed. For example: it is a fault for a Collie to carry its tail curled over its back, but this is what is required of the Samoyed. Standards for the same breed can also differ slightly from country to country. For example, the American Collie Standard describes the Collie very closely to the English Standard with just a couple of minor variations. One is size. The American Standard allows for Collies to be up to two inches taller than what is required by English Standard. Australian Collie breeders use the Breed Standards of the Country of Origin (i.e. where the breed was developed). Therefore; Australian Collie breeders abide by the English Standard for Collies, whereas German Shepherd breeders use the German Standard as their model and Kelpie breeders use the Australian Standard because Kelpies originated in Australia, etc.